If your company is in the market for a new website and aren’t sure where to start as far as setting your budget, you’ve come to the right place. Here is an abbreviated version of what we go through with companies as part of our Blueprint process. This post was first published in 2014 and has been significantly updated and republished. Let's talk about the nitty gritty details of rocking out a social media campaign. We have tons of tools and how-to blog posts on Facebook, LinkedIn , Twitter and more. This is our time to step back and think big picture. Here's a step-by-step approach to help you plan, create, and execute a social media campaign like a boss. HubSpot has a new low-cost option that includes email marketing. If your business has multiple locations, or even just one physical location, it's worth investing in a Local SEO strategy. Your customers and potential customers are searching for your services and you need them to visit your website, leave a review, or find your physical location. There are steps you can take to improve your chances of showing up in Google's Local Pack, Local Finder, Google Maps, Facebook and organic search rankings. The following five Local SEO basics range from super easy to mildly technical. Here's what you need to do. Has your website traffic hit a red light? Time to change your content strategy again! You might have heard that pillar pages are a proven way to attract qualified leads and boost traffic. But where to start? Let this post be your guide. This post was originally published in 2014, practically the dark ages! Much of the content is still relevant, but we've updated the post and added a section on how to use Google Data Studio to create an awesome monthly marketing report, for free. Enjoy! Your monthly marketing presentation is coming up and it's time to step up your game. This is part three of our "How to Webinar" series, and was originally published in 2011. It's high time we update and expand the content here. Our last post was A Step-by-Step Guide to Promote Your Next Webinar, and before that How to Host a Webinar that Will Generate Leads for Your Business, and I recommend you read those first if you want more details on creating a successful webinar. This post is part of our "how to webinar" series, and was originally published in 2015. We've updated and expanded the post here. Our last post was How to Host a Webinar that Will Generate Leads for Your Business, and I recommend you read it first. Webinars or webcasts are a potential powerhouse for your digital marketing strategy. If you've planned properly and thought of every detail, you've laid a good foundation for success. Don't stop there! You have to make sure people know about your webinar and show up. Promotion is just as important as your planning steps (see How to Host a Webinar That Will Generate Leads for Your Business). If you have an upcoming webinar on your content calendar, here are a few ways to promote it well. This post is part one is our "How to Webinar" series, and was originally published in 2014. We updated it with current best practices, tools, a script and extras. 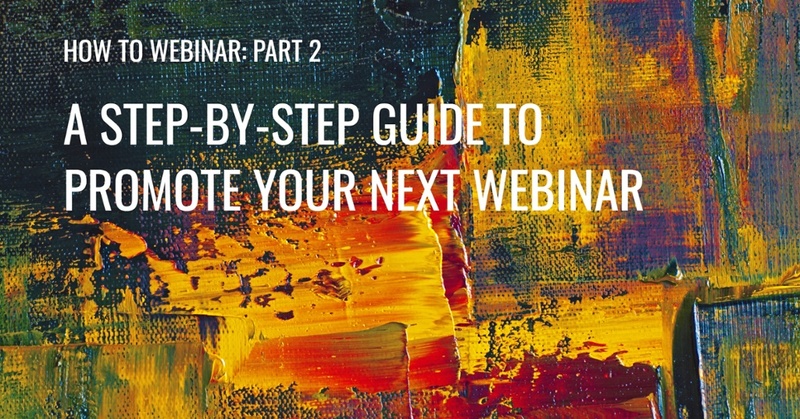 Part two is A Step-by-Step Guide to Promote Your Next Webinar, and part three is 10 Essential Tips for How to Record a Webinar. Digital marketing is a holistic, integrated program that contains many moving parts and tactics. It can include tactics like blogging, social media advertising, SEO, video, email, apps, and long form content. Webinars or webcasts can be one of the most powerful and high-value components of your digital marketing program. This post was originally published in December 2015. We've updated it for webinar best practices for business in 2017. Webinars or webcasts are a powerful lead generation tool in your digital marketing program. As a middle of the funnel offer, a webcast is more personal than an article or ebook and help potential clients get to know your company before having a sales conversation.